Spring has sprung in Seattle! ​Springtime in Seattle still means a lot of rain... but maybe a bit less grey, offset by welcome layers of lush, colorful life springing forth, and even some stretches of sunshine. It's a time of renewal, and so it seems fitting that the Hydrospheric Solutions shop has also been buzzing with activity. We are fully settled in our new shop space positioned along the ship's canal in the lively neighborhood of Fremont. After some winter's rest for our crew, ourselves, and our gear, we have enjoyed the past few weeks of reuniting with the team to roll up our sleeves as we give the ProSAS-60 a major refurbishing following the long service she provided during the MH370 search effort. ​Check out the short drone video our pal (and top-notch technician!) Ransom White (bluedotgeohydro.com/) put together during one of the recent breaks in the spring rain. We love the bird's-eye vantage point that it gives of our new neighborhood, with a glimpse of downtown Seattle, a taste of the maritime influences around us, and buzz through of a day in the life in our busy shop space. Hydrospheric Solutions, Seattle Shop - - It's a beautiful day in the neighborhood! from Hydrospheric Solutions, Inc. on Vimeo. ​Twenty-seven months ago Hydrospheric Solutions joined the search for for the missing Malaysia Airline Flight MH370. We proudly entered the search bringing what we believed to be the best technology fitted for the job. Along with us, the very best crew members, plus a whole lot of grit and determination. Oh, and plenty of hope. As we wind up our involvement in the MH370 search effort, and we welcome our tattered gear back home to Seattle, we are humbled by all that this past 2+ years has brought with it. Hydrospheric Solutions truly is a small fish in a big sea and we are grateful for the opportunity to have contributed. We are incredibly thankful for our dedicated Hydrospheric Solutions crew for their many long months of 24-7 service. (It wasn't always pretty, and for reals... you guys are awesome!) We have deep respect for the professional teams working with us and alongside us. We recognize and congratulate the various governments contributing to the search, and particularly commend the ATSB for their leadership, and the tireless dedication of their team. And, although we have not done it yet, we are ever hopeful that Hydrospheric Solutions will play a part in locating the missing MH370... some day. A story of the searcher becoming the searched﻿, the lost becoming found, and, the weather. The last time I found myself sitting down to write an update on Hydrospheric Happenings, it was a delightfully sunny Spring day in the heart of London. With wide blue skies above, it seemed even the birds were singing particularly gleeful songs of Springtime optimism. Hydrospheric was geared up and eager to have a presence at Oceanology - the biggest event in the oceanic industry - mingling with peers and maybe meeting a few new folks. The future felt bright on that glorious Spring day! Less than a week later, Jay and I found ourselves trying to out run an unforgiving Autumn rainstorm as we made our way from the taxi to the shelter of our hotel, having just completed a 23 hour trip from London to Fremantle, Australia. An unexpected turn of events required our presence in Fremantle, the hub of search operations for the missing Malaysia Air Flight MH370. A few days earlier, still in the crisp London sunshine, basking in the success and inspiration found during Oceanology, we received The Call. Our sonar had been lost! On March 21, nearing the end of a difficult 45-day swing in the remote Southern Indian Ocean, the cable termination failed and the Hydrospheric ProSAS-60, still tethered to her depressor weight, took a 3000+ meter nose dive through the water column. Aside from the report of an injury to a Hydrospheric crew member, the news that your one-of-a-kind sonar is lost, presumably resting on the seafloor (in unknown condition), in the middle of a gigantic ocean is absolutely the worst possible news a small business like ours could receive. Fast forward one very long, stressful, anguish-filled month, and the news improves. Through the support, expertise, and efforts of MANY, the Hydrospheric ProSAS-60 once again sees the light of day as she is lifted aboard (intact!) thanks to a specialized ROV and an amazing team of experts from Hydrospheric Solutions, Phoenix International, the M/V Dong Hai Jiu 101, and the ATSB. Today, the sun is once again shining in the lovely seaside town of Fremantle. And, despite an uncertain month of cold-storage in the depths of one of the most remote deep-sea locations on the planet - the Hydrospheric ProSAS-60 sonar is dockside, safely strapped to the deck of the M/V Dong Hai Jiu 101. We are grateful and elated to have her there, where our Hydrospheric team is hard at it with repairs to get her back to the important work that still lies ahead. Turns out, the future really is bright, after all! Hydrospheric Solutions is in London! We spent the past couple days seeing the sites, soaking in the March sunshine, and preparing for Oceanology International... the biggest marine industry gathering of 2016. Oceanology International is a big deal in the oceanic world. It's a cornerstone event in the industry that is held every other year in London and draws a unique crowd of marine scientists, ocean explorers, leaders in deep sea technologies, as well as curious on-lookers. It's a gathering of the latest technologies, and the minds behind them, drawing close to 10,000 participants and visitors worldwide. Hydrospheric Solutions is excited to be here ! Not only because London is a fabulous city, and the sun is shining, which is an unexpected springtime treat, but also because we are manning a full-on booth at a full-on industry conference for the first time ever ! Yep, we feel pretty legit. Today is the set-up day, so the gigantic expedition hall is buzzing with activity as 520+ exhibitors prepare for the influx of crowds beginning tomorrow morning. The scale of construction, infrastructure, and the level of glitz is pretty high around us. By comparison to some of our neighbors, we are staking out a small piece of the action. But, we are proud of our stake and anxious to chat with peers, friends, and all of the curious minds that will fill this space beginning tomorrow. Check out our time-lapse video capturing a stealthy booth build-out by Jay, Katrina and Matt (our co-host from Geo Marine Technologies). If you are in London... stop by and say hello! Hydrospheric Solutions in London! Check out our booth build-out as we prepare for the 46th Oceanology International. from Hydrospheric Solutions, Inc. on Vimeo. 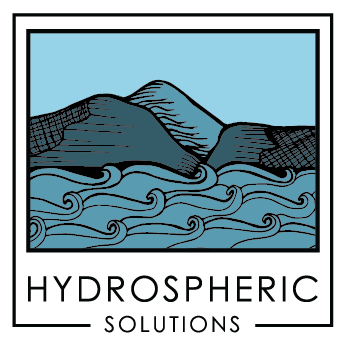 Hydrospheric Solutions Launches a Website!